Once upon a time I went to a show and it was called Fun Harmless Warmachine. It was by Fin Coe and directed by James Fleming. It was about a man named Tom (Daniel Chenard) who was working at a boring insurance agency and was very deep into the online gaming community. He asks out a woman from his office named Melissa (Emily Marso) but she turns him down. Then he gets asked by Niko (Victor Musoni) to be a part of a online gaming clan called the Order of the Sword, lead by Hunter (Robert Koon). The clan promises to help him punish Melissa for disrespecting him. He quits his job after the clan gets him work with an online gaming company, Octopunk, and his life seems to be getting better until he tries to leave the Order when he wakes up to the fact that they post anti-feminist tweets and ruin people's lives by leaking private information via his accounts. It is about sexism, male power, and what makes an act unforgivable. Tom has a very different personality when he is online than when he is off. He is like the Jekyll and Hyde of gamers. He actually seems like a genuinely good person when he is not playing video games. In his actual relationships with people, like DC (Londen Shannon) and Ekaterina (Ayanna Bria Bakari) and his little brother Jack (Musoni), he clearly cares a lot about them. But when he plays video games he feels like that is the most important thing in his life and nothing should get in the way of that. It makes him feel more competent and confident about himself, but he is less likable because of how cocky and selfish he is. He doesn't think of people as real people when everything around them is virtual, even though there may be a real person behind them. It enables him to treat people badly without any thought or restraint. Half of the time you are like, this guy is great he deserves a good life and half the time you are like, this guy is a terrible person and doesn't deserve the things that he has. Even though he is our protagonist, he is not a hero. Part of me really hoped that he would get redeemed, but I think it was better for him to actually get cut out of people's lives and not be immediately (or maybe ever) forgiven. I think it was good that they don't give the audience the immediate gratification of him being forgiven. The last scene of the play was very moving and I thought it had an interesting message. 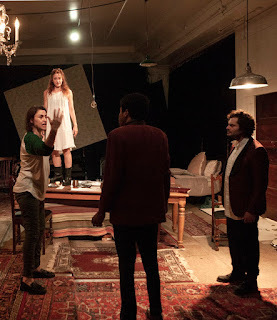 But since it is the last scene of the play, it had some spoilers in it, so you can read it here if you don't care about spoilers or have already seen the play. I really like the movement (choreographed by the director and cast) in this show. I love how people would face each other when they were talking to each other most of the time even when characters were talking online or on the phone. I feel like sometimes in shows they lose the intimacy in the scene because they are online, but because of the movement in this show they did not lose the relationships. The movement was also used to simulate things in the video game. They would crouch on chairs and say classic gamer lines and shoot at each other in what seemed like real life. It was a lot more visceral to see them yelling childish things with a body in front of them. Much more than just watching people play video games and yell at a screen. Notifications would also come in during the game and the actor playing the character sending the text would stand in front of Tom and he would swipe them out of the way, which was sad to see how he could swipe away real people like they were notifications and how much the game had taken over his perception of the world. People who would like this show are people who like coffee shop confrontations, visceral movement, and Jekyll and Hyde gamers. I think that people should go see this show. It is a fascinating concept. 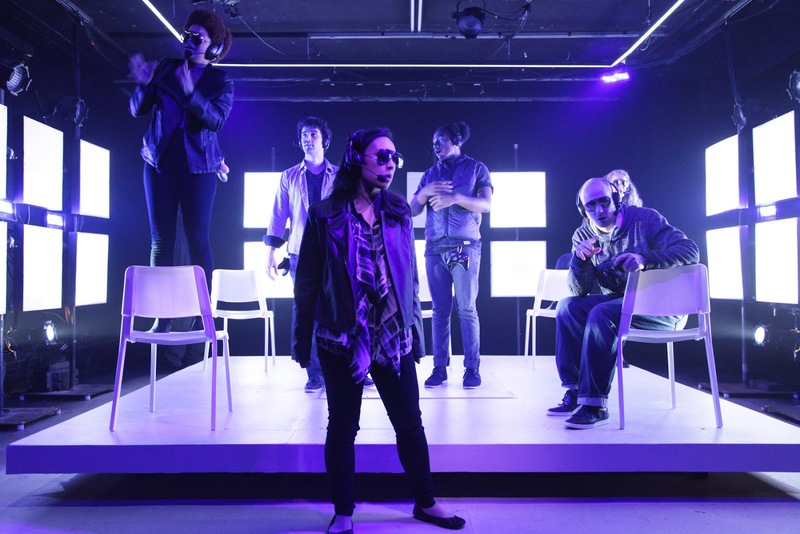 It is really well written, directed, performed, and choreographed. It made me think more about how people online are actual people, even if they are not the people they are pretending to be. Once upon a time I went to a show and it was called The Curious Incident of the Dog in the Night-Time. It was by Simon Stephens based on the novel by Mark Haddon. It was directed by Jonathan Berry. It was about a boy named Christopher (Terry Bell) who is in his early teens in a town called Swindon. One day he discovers that his neighbor Mrs. Shears' (Eunice Woods) dog Wellington has been killed. He decides he must investigate who has killed Wellington and along the way discovers his family secrets and how strong he is and how he is capable of so much more than he was told he was. It is about family, consequences, and perspective. I think this was a really beautiful show. I really loved the story and character work. Christopher's discovery of his mother's letters was absolutely heartbreaking and beautifully staged. He built a wall around himself with the trains and blocks and just curled up on the floor. I think everyone has felt like that and has wanted to do what Christopher did but most of us are afraid that we can't act that way. How calmly he executed it and how emotionless he seemed after his whole idea of his mother had been blown apart was heartbreaking and really well done. The mother (Rebecca Spence) was a very complex character. She seemed to love Christopher so much, but her decisions made it seem like she didn't. Most of the people in this show don't make completely rational decisions, and that makes these characters interesting and easy to relate to. Christopher's father (Cedric Mays) also makes very irrational decisions about Christopher's mother. He lies to Christopher to lessen the blow, but it ends up hurting him more than if he'd just been told the truth. Even Mrs. Alexander (Meg Thalken), who seems very reasonable and to know her way around a conversation, sometimes will mess up and say something she shouldn't have said. I really loved the storytelling choices in this show. The way the story flows together and the movement choices (by Dan Plehal) were lovely. One of my favorite moments of movement combined with text was when Christopher was in the train station reading all the signs and the ensembles voices were all overlapping. The movement is getting faster and they are walking around him, and Christopher is getting more and more uncomfortable until Siobhan (Caroline Neff), Christopher's mentor at school, stops it all and tells him that all he has to do is think about each step as he walks. It is a very touching and sweet moment between Siobhan and Christopher as well as a visually stunning moment. I also thought it was very compelling how Christopher's story that he made out of the murder of Wellington became a play that we were watching. It would go between the story and the rehearsal process for the play, but at first it isn't clear that that is what is happening. 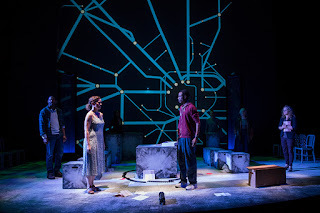 The reveal that it is a play within a play drew me in because it showed the process of making the play and of working with Christopher and also how different people in his life are playing roles in the play. He has very strong opinions about who can play whom. Like when Reverend Peters (Christopher M. Walsh) wants to play the policeman, and Christopher says, "You're too old to play a policeman." That was one of my favorite lines from the rehearsal scenes because of how perfectly it shows how unfiltered Christopher is as a director. I really love the idea of math in this show and how it is worked into Christopher's thinking process. It also contributes to one of my favorite comedic moments in the show. Because this whole show is from Christopher's perspective narrated to us by Siobhan, it is how he sees things instead of how people see him. I really like how when he is riding past things on the train he doesn't look at them and say, "there are some cows, there are some houses, there are some horses." He has to figure out the exact number of them and he can figure that out in a split second. I find it fascinating to think about his thought process compared to mine and notice the similarities and differences. He thinks about how everything is connected, which is how I think about things, but I don't think of groups of things in numbers. I think of the features of the things. 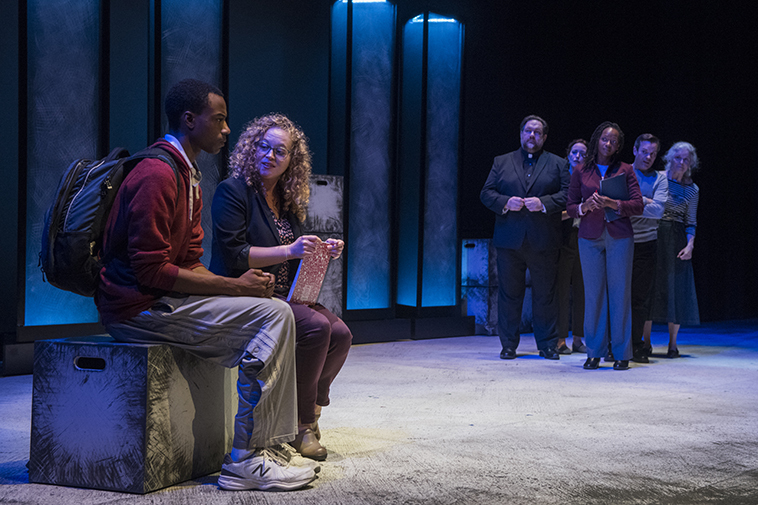 In the middle of the show Christopher wants to explain how he solved a math problem, but Siobhan tells him that whoever wants to stay after the play and hear the solution can, but that most people will find it boring. But when he came out and explained it at the end, he was so elated to be explaining math to us--and he made it such a spectacle by using lights, sound, projections and even confetti cannons--that it made me want the show never to end so I could spend more time with Christopher and learn more math (which I never thought I would say). People who would like this show are people who like multi-textured mysteries, complex characters, and celebratory equation confetti. I loved this show very much. I think it is absolutely beautiful and funny and overall an awesome experience. Once upon a time I went to a show and it was called Caroline, or Change. The book and lyrics were by Tony Kushner and the music was by Jeanine Tesori. It was directed by Lili-Anne Brown and the music direction was by Andra Velis Simon. It is about Caroline (Rashada Dawan) who is a maid for a Jewish family in the 60s in Louisiana. 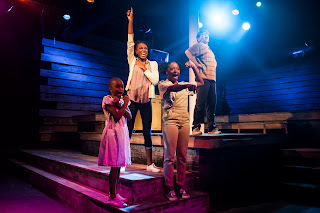 She is a single mother to three kids, Emmie (Bre Jacobs), Jackie (Princess Isis Z. Lang), and Joe (Lyric K. Sims). She is not proud of her work, but she passes the time doing laundry by listening to the radio and the singers on the radio are personified and become her chorus (Roberta Burke, De'Jah Jervai, and Emma Sipora Tyler). So do the Washer (Tyler Symone) and the Dryer (Micheal Lovette). Noah (Alejandro Medina) is the son of her employers, Rose and Stuart Gellman (Blair Robertson and Jonathan Schwart) and is obsessed with Caroline and thinks that she seems more powerful than his father. She doesn't feel powerful herself. 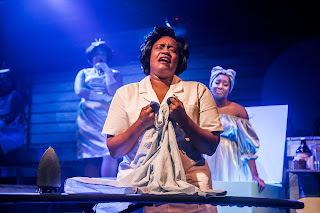 She is scared of her daughter getting hurt in the fight for civil rights and she thinks her friend Dotty (Nicole Michelle Haskins) is being selfish and living her life too boldly. Caroline gets an extra pay boost when she is allowed to take the money that Noah leaves in his pockets, but she is conflicted about taking money from a kid. She is conflicted about change in two senses. This musical is about stepping out of your comfort zone, identity, and family. I thought that this was a really really good show. There were excellent performances and I thought it had an especially intriguing premise. One of my favorite songs was "The Bus." The Bus (Lovette) had such great control over his voice and I loved listening to him as both the Dryer and the Bus. His entrance was so abrupt; you just hear this very low note come from offstage. It almost sounded like he was crying throughout the song, which is appropriate because he has just found out JFK has died. That is also why the abruptness is appropriate. I also really liked "Laundry Finish." I loved the washer and the dryer and I thought it was interesting how they were personified. I loved how Caroline interacted with them. She seemed kind of frustrated with them in a way but she was also thankful for them. I thought the high notes were really well sung and I liked the humor of the song, like when the Washer seemed so proud of her work and the Dryer used innuendo with Caroline. I also enjoyed "Roosevelt Petrucius Coleslaw." It was like a nursery rhyme that Caroline's kids and Noah sang about a very ugly boy and how sad his mother was when he died. It had some darker undertones to it, like most nursery rhymes, but it showed the sisters' relationship with each other very well. And Noah wants to be a part of their family, so in his head he is playing games with them and singing. It shows you how lost he feels and how he thinks he would be accepted and happy if he lived with Caroline. I think Caroline was a very interesting character and Dawan did an amazing job with the role. You could see the love she had for the people around her, but also how she wasn't always great at showing it. She would try her best to make enough money to give her kids what they wanted and needed, but she was also kind of harsh with them even when they were just trying to help. She also had a very strong connection with Noah but got very easily angry at him because she didn't want Noah or herself to get in trouble. Noah sees her as "the president" and thinks very highly of her because she is so stoic but determined and caring--which is a classic image of a ruler. Rose's opinion of Caroline is very complex. It is hard to tell whether she comes up with the plan of Caroline keeping Noah's change because she wants to teach Noah a lesson or to break up the relationship between Caroline and Noah so she herself can be the more prominent motherly figure in his life. It also might be a bit of guilt because she doesn't pay her enough. Caroline doesn't seem to like Rose very much, and I think that is because she, like Noah, misses his mother. It would be interesting to see Caroline with Noah's mother and how her relationship differed with her and Rose. I think the Chanukah party scene was very nicely written and performed. It did not play out the way I expected it to. I thought it was interesting that this is the first time we see Emmie and Dotty serving other people. I thought that Emmie would behave like a servant and that would be hard to watch because Emmie is such a forward thinking person who speaks her mind. But she speaks up and gets into a conversation about civil rights with Rose's dad, Mr. Stopnick (Michael Kingston). He doesn't get mad at her; he starts a conversation with her. But Caroline drags Emmie away because she is worried about what will happen to her. It is really hard to watch Caroline be so worried for Emmie and Emmie to be so mad at her at the same time. A lot of times Caroline would have been right to tear Emmie away because the situation could have been dangerous. But it wasn't in this case because the person she was talking to wasn't going to hurt her because she had a different opinion than him. It really shows the effects of racism on people and how hard it is to assess whether people are willing to engage in conflict without violence. People who would like this show are people who like dark nursery rhymes, President Caroline, and thoughtful consideration of conflicts still happening today. I think this is a really really great show. All the performers were great. I really like the musical and what it has to say about change, society, and family. I think that people should definitely go see this beautiful show. I loved it. Once upon a time I went to a show and it was called Charlie and the Chocolate Factory. The book was by David Greig, based on the novel by Roald Dahl. The music was by Marc Shaiman, and the lyrics were by Scott Wittman and Shaiman. Some songs, by Leslie Bricusse and Anthony Newley, were originally from the 1971 movie Willy Wonka & the Chocolate Factory. It was directed by Jack O'Brien. 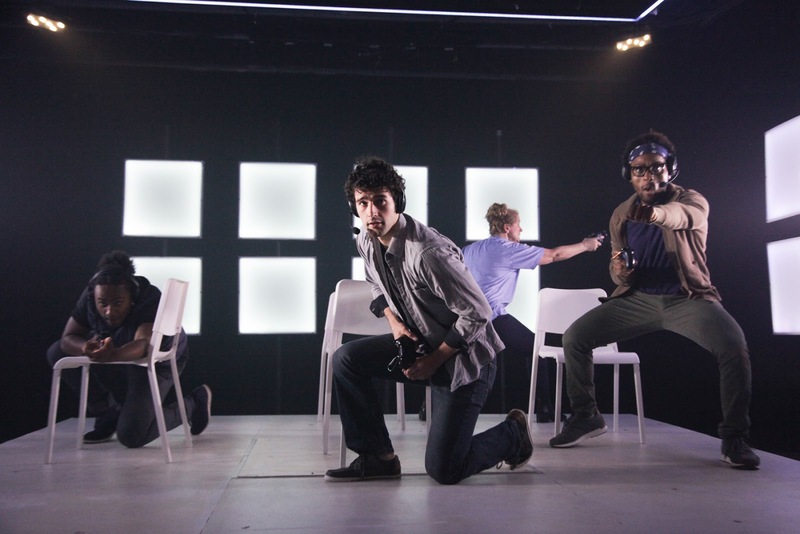 The choreography was by Joshua Bergasse and the music supervision was by Nicholas Skilbeck. It was about a young boy named Charlie (Henry Boshart) who wanted to become a chocolatier and was obsessed with the candy made in his town by Willy Wonka (Noah Weisberg). 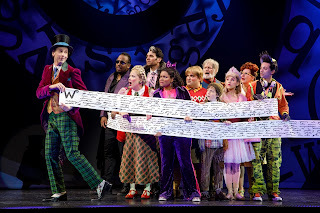 When Willy Wonka starts a contest to find golden tickets in Wonka chocolate bars, Charlie asks if he can buy them, but his family is too poor to buy more than one a year. Still he lucks out and finds the last golden ticket. But the other winners are not as promising as Charlie. Veruca Salt (Jessica Cohen), is a Russian ballerina and very bratty. Mike Teevee (Michael Quadrino) is very mean to his mother (Madeleine Doherty) and sits around playing video games all day. Augustus Gloop (Matt Wood) overeats and doesn't listen to directions. And Violet Beauregard (Brynn Williams) comes from a privileged and famous family and is a bubblegum pop star. They all go on a tour of the factory together and not everyone comes back out again. It is about consequences, entitlement, and creativity. I think this is a really interesting take on a classic story and the young actor playing Charlie did an especially great job. I was a little bit disappointed that Charlie was the only kid actor in the show. I did not know why for the first half, but then I realized in act two that it was because their deaths were not implied and were gruesome and blatant. I think the reason why they cast adults is because they were afraid people would be scared or offended by watching real kids get ripped apart or exploded. Another thing that confused me were the logistics of the scene leading up to the dream ballet between Charlie's dead father and Charlie's mother (Amanda Rose). Charlie is woken up on his birthday and is given a chocolate bar and is immediately sung back to sleep by his mother seconds later. It takes me out of the story when things don't make sense. I'm fine with magic and mystery, but I want the timeline to make sense. I really liked the songs "When Veruca Says" and "Queen of Pop." They were very catchy and embodied the characters of Veruca and Violet very well. They were both sung and danced by very talented singers and dancers and I love how they incorporated the fathers (Nathaniel Hackmann and David Samuel). It was funny to see how much these fathers feared their daughters. I loved the choreography in both of them. I'm not so sure I liked the idea of Veruca being so good at a physically taxing form of dance, because that shows that that character is very determined and passionate about the art she makes, which makes her seem less awful. The end that she meets is very savage, so you need her to be pretty awful so it doesn't seem like overkill. 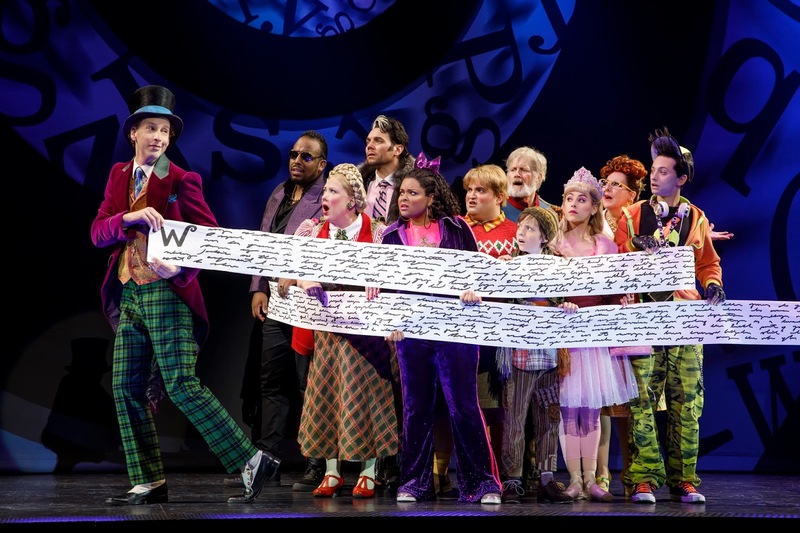 "It Must Be Believed to Be Seen" and "The View from Here" were my two favorite songs because together they showed the development of the relationship between Wonka and Charlie. I especially like the last song because you see how far they have come and how many similarities they have. 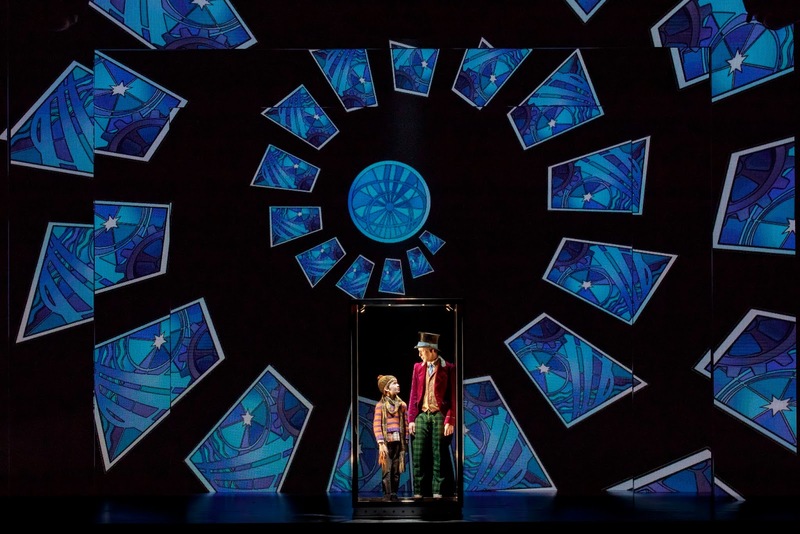 "It Must Be Believed to Be Seen" is very alluring and introduces you to Wonka as Wonka not Wonka incognito. You get to see how much love he has for his craft, but how secretive he is about it. "The View from Here" shows the more sentimental and loving side of Wonka which he basically has hidden until this scene. I really liked how Charlie and Wonka built off of each other's energy in this scene. I thought they did a good job making the preceding chaos mean something. I was actually pretty moved by it. People who would like this show are people who like reimagined classic stories, chocolate mentorships, and gruesome deaths. I think this is an interesting show. It shows a side of Charlie and the Chocolate Factory I hadn't thought of before. I think it has some great performers and some good songs. Once upon a time I went to a show and it was called Tootsie. The book was by Robert Horn and the music and lyrics were by David Yazbek. It was based on the story by Don McGuire and Larry Gelbert and the Columbia Pictures film. It was directed by Scott Ellis. The choreography was by Denis Jones and the music director and conductor was Andrea Grody. 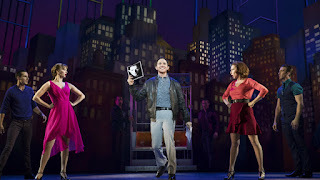 It was about a struggling actor named Michael Dorsey (Santino Fontana) who had been out of work for a really long time and had alienated many directors because of his strong opinions. His friend Sandy (Sarah Stiles) was auditioning for a new Broadway musical called Juliet's Curse and they were looking for a new actor to play the nurse. So Michael Dorsey decides to become his new alter-ego Dorothy Michaels and audition. He gets cast and meets Julie Nichols (Lilli Cooper) who plays Juliet and they instantly have a very strong connection, but he can't reveal his male identity or else he thinks he'll get fired. It is about identity, connection, and manipulation. I thought this show was a lot of fun and I think it has some good updates to the story. I thought this show had a lot of really good updates, especially to the character of Julie. In the movie, Julie seems a lot more helpless, but in the musical she seems more powerful, speaks up for herself, and doesn't let societal norms pressure her into doing something she doesn't want to do. I really liked the idea in the show that a relationship between Julie and Dorothy could be possible even if they were both women. They come a lot closer to exploring gender identity than in the movie, but it is still a story of a straight man dressing in drag and manipulating a woman. But in this case the woman is more angry and less devastated and the show and Michael both recognize that she deserves her anger. Michael does still love her, so he needs to tell her why he did things and how he feels. But he doesn't expect her to just quickly get over everything. I don't know exactly why they switched the project Michael does as Dorothy from a soap opera to a musical, except that it was more convenient for people bursting into song constantly. I enjoyed the update to the lead actor character Max Van Horn (John Behlmann) because I loved his performance and thought he was hilarious. But Juliet's Curse was not always engaging. It was funny when the story was ridiculous, but it was hard to get invested in because it wasn't an episodic that was always transforming. I love Michael's roommate Jeff (Andy Grotelueschen) and Sandy in this show. They were so hilarious and I loved all their songs. Sandy had this song, "What's Gonna Happen," that she keeps reprising that I think sums up her character perfectly, which is an adorable nervous wreck. It is a song where she hears one proposal of an idea and starts listing all of the terrible events that will follow if she does this. As it starts to escalate, the song gets faster and she gets more panicked. Eventually someone cuts her off and calms her down. She handles the speed very well; miraculously, you can still understand everything she's saying. "Jeff Sums It Up" was basically a song about exactly all the crazy ridiculous stupid things Michael has done. I liked how unabashed Jeff was about calling Michael out on all of his crap. I didn't think I could like someone in this role better than Bill Murray, but I think I did! They spent more time in the musical on his and Michael's relationship, and I think that was a really good decision because I loved their relationship and wanted even more of it. And Jeff was absolutely hilarious. Dorothy had a song called "I Won't Let You Down," which was her audition song. It was really crazy hearing Santino Fontana singing in that higher register and doing it flawlessly so it didn't sound like mock femininity, which I was a bit worried about. I think it is hard to avoid that when your voice is not naturally that high, but he did a great job at making it sound natural and not forced. That was true of the speaking as well. I loved how he alternated between the higher and lower tones and you could hear glimpses of Michael's voice in the audition. He didn't have a single crack throughout the show even though he shifts back and forth between these voices a lot. I thought his performance of Dorothy was really well-acted and -sung. I really like Dorothy as a character. She is sweet, she's a badass, and she has very strong opinions. Michael is very opinionated as well, but he doesn't have the sweetness at first. He grows empathy throughout the show. It is weird that we still think of empathy as a female characteristic, and I am looking forward to a day when the world doesn't assign emotions to genders. But I do think that it is great that there is a case in a musical and a movie of a man learning about empathy and why it is important and that not making him weak. I don't want to give anything away about the last scene, but it almost made me cry. It was really well-acted and I loved the connection between Michael/Dorothy and Julie. People who would like this show are people who like flawless falsetto, compelling updates, and hilarious supporting characters. I think people should go see this show before it closes here or later on Broadway. I'm excited to see how this musical will evolve when it moves to New York. Once upon a time I went to a show and it was called Phoebe in Winter. It was by Jen Silverman, and it was directed by Dado. It was about a family whose sons--Jeremiah (Jacob Alexander), Anther (David Dowd), and Liam (Elliot Baker)--had been at war and were now returning home. Waiting for them at home are their maid Boggett (Shawna Franks) and their father Da Creedy (Kirk Anderson). Boggett has a special attachment to one of the sons, Liam, and when he doesn't return she is devastated. Suddenly in the midst of this homecoming, Phoebe (Maria Stephens) arrives with a gun and tells everybody that she will be their new sister because they killed her brothers. They battle the new family dynamics this forces them into and debate who will take on what roles. It is about war, family, and how they can be like one another. I had a very visceral reaction to this show. A lot of strangely disturbing things happen, and I am excited to explore and talk about this play more. The atmosphere of this show is very eerie. They have live sound effects and music (composed by Emmy Bean) coming from the other room. 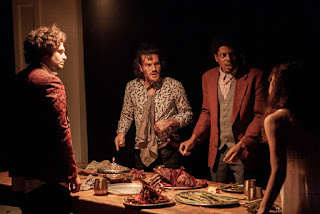 On your way into the theater, there are people in masks (Bean, Sarah Thompson Johansen, and Zachary Angus) striking wine glasses and wandering around. They would also walk around in the theater and mutter things under their breath. There are people walking in your path while you are trying to get to your seat muttering things you can't quite understand, and this is all very disconcerting. The set was like a Victorian painting after a fight. The entire show is also performed on steps that the audience also is seated on (set design by Joseph Wade). My chair was on two steps, which gave me a teetering feeling and made me feel a bit uneasy. The actors have to use the steps throughout the show and I was worried one of them might hurt themselves. It keeps you on the edge of your seat for you and the people you are watching. 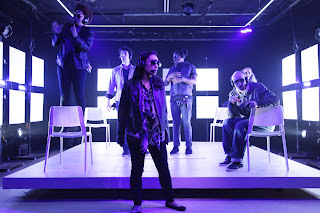 They also used a strobe light (lighting design by Mike Durst), which is something else to make you disoriented. All the props seemed to have a gothic feel to them and the actors would throw things and no one on stage seemed to notice or care. 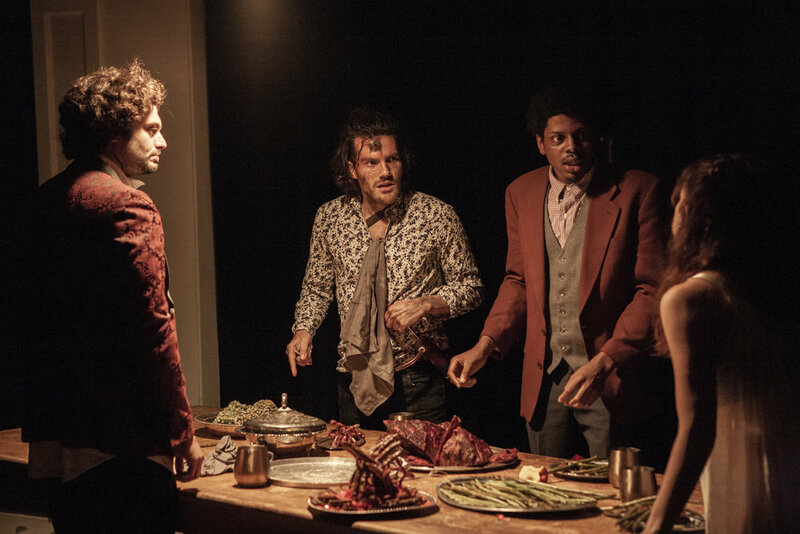 And they had all these foods (prop design by Samantha Rausch) that looked sort of like roast beef but it was like uncooked and big and stringy. It was very gross and looked like a part of a corpse. The entire room reminded me of an Ivan Albright painting, just the whole disintegration of something that once was beautiful. The entire atmosphere looks unwelcoming and uncouth. I think the production wants you to feel uncomfortable and intrigued. You are kind of on your guard the whole time like you would be on a battlefield. I think the show was trying to show us how horrifying the family dynamic was and how it could reflect our own. 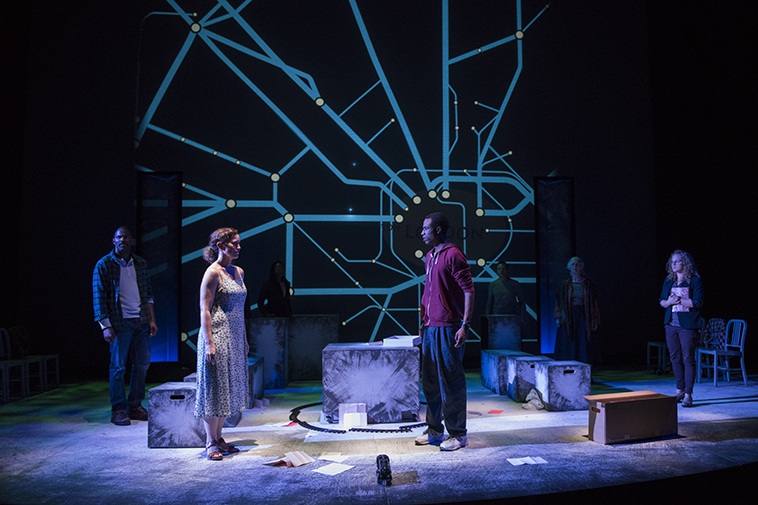 It was also trying to show the connection between families and war and how the line is much thinner than you might think it could be because of how some families treat each other. They actually go to war against each other in this show instead of figuratively going to war. They also switch roles in the household, so Boggett becomes Liam and the father becomes Boggett and Phoebe joins the family as their new sister. Once all their roles had changed, they seemed to have love for the replacement and not the actual person, which is a really interesting thing to think about. People who would like this show are people who like blood pumps, grotesque gothic meals, and teetering on the edge of sanity. I think this is a very interesting show. I am still thinking about a lot of parts of it. It has some really good philosophical and gut-wrenching ideas and a really interesting concept. Once upon a time I went to a show and it was called Legally Blonde. The music and lyrics were by Laurence O'Keefe and Nell Benjamin and the book was by Heather Hach, based on the novel by Amanda Brown and the Metro-Goldwyn-Mayer motion picture. It was directed and co-choreographed by Trent Stork, co-choreographed by Megan E. Farley, and music directed and conducted by Kory Danielson. 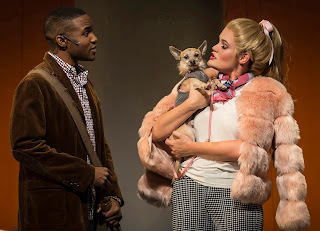 It was about a woman named Elle Woods (Casey Shuler) whose boyfriend Warner (Tyler Lain) breaks up with her and she decides she is going to follow him to Harvard Law and get him back. She gets in and meets Emmett (Gerald Caesar), who is one of the only people who believes in Elle and is the TA for Professor Callahan (James Rank). And in Callahan's class she finds out that Warner has a new girlfriend, Vivienne (Jacquelyne Jones). She decides she is going to win him back through her successes at Harvard. Even though it starts out seeming like it is a story about getting a man's attention to fulfill your purpose as a woman, it turns out to be a show about being yourself instead of changing yourself for a man. I thought this was a really fun show. I really liked the songs, and I thought the cast was amazing. I really liked the song "What You Want." It was all about how Warner didn't see that Elle was the perfect woman for him, but maybe if she got into Harvard Law, then he would. It has all these different segments of her taking the test and having different distractions, like at one point a shirtless guy just dances on her table while she takes the test. 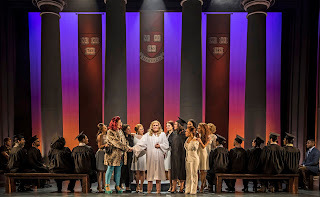 I loved Elle's friends--Serena (Lucy Godinez), Margot (Sara Reinecke), and Pilar (Kyrie Courter), who were also her inner voices in the form of a Greek Chorus--in this musical and their role in this song. There was a crazy dance number and some hilarious comedic sections. I also really liked that the writers didn't make Elle's friends just classic Valley girls. I really liked the characters and they seemed like good friends. They didn't feel annoying to me. I loved their singing and their chemistry with Elle on stage. I thought the song "Legally Blonde--Remix" was really well performed. I was especially impressed by the high note that Vivienne hit. It was so perfect that it gave me chills. This was the song that most obviously flipped the story around from being about trying to win back a man. Vivienne decides she doesn't want to be against Elle anymore. She wants to stand by her and realizes what a jerk Warner is. And Elle is realizing that she needs to stop trying to change herself so that people will like her. This is also where Paulette (Sophie Grimm), Elle's hairdresser and friend, finds out that Kyle (James Doherty), the UPS guy she has been obsessing over, is actually the Irish dream she has been waiting for. They have a little jig together as part of the parade of people going to court to support Elle. I really loved these two characters and the hilarious chemistry they had together. It was just really fun whenever they were on stage. I liked how this show didn't conform to a lot of ideas of masculine and feminine. It doesn't think women have one thing they can do; it shows a large array of how women can dress and be and act and still succeed. Elle, Vivienne, and Enid (Teressa LaGamba) are very different types of women, but they all succeed at being lawyers. I think the show thinks as well that being a man or being a woman should be enough masculinity or femininity as long as you identify that way. The song "Take It Like A Man" is where Elle takes Emmett shopping so that he can better reflect what is on the inside and impress his boss and the court. They have all these suggestions that they are falling in love during this scene. 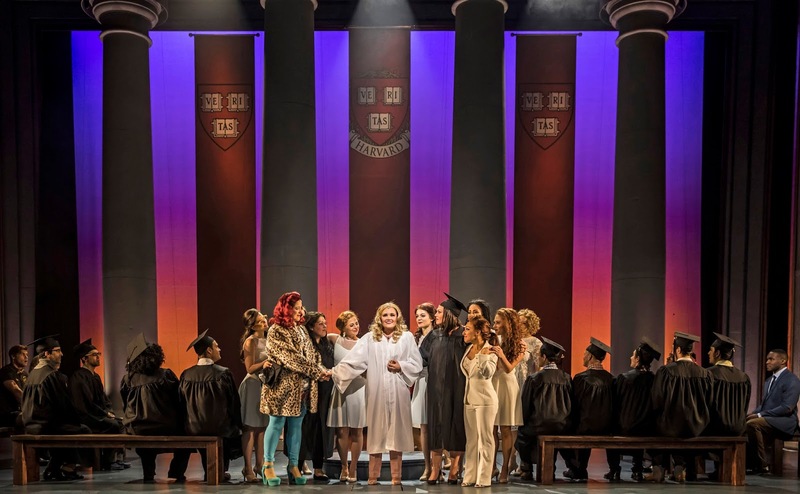 It is a makeover song, but unlike most makeover song--and even the other makeover songs in this show ("Legally Blonde" and "What You Want")--it is not about a changing a woman. It suggests that paying attention to your appearance shouldn't just be for women. Emmett and Elle bond so much during this song, and you get to see them just talking to each other and just having fun. It makes you really want their relationship to turn out well and shows you that it is not at all like the relationship she had with Warner, which was based on superficial things. In this song, shopping is not superficial; it is a chance to connect. I think this is an example of her showing why her charity, Shop for a Cause, might actually have worked! People who would like this show are people who like Irish fantasies, fabulous Greek choruses, and shopping for the cause of love. I think that people should see this show. It is a lot of fun, hilarious, and a surprisingly communal experience. I really liked it.